This is Fr. Basset’s own “How To Use This Book” section from Following Christ Through The Gospels. This method of prayerful Scripture study should appeal to all those who want to know Our Lord. But there is one factor that only YOU can contribute: 15 minutes a day. Reading & following one of these Gospel inquiries each day, for only 15 minutes a day, is the guarantee of success. Whether pursued alone or in a prayer group, if the inquiry is limited to fifteen minutes, then the passage chosen for discussion will of necessity be short. Long excerpts encourage superficial answers and dodge those small, intimate suggestions which Our Lord hides in every word of the gospel text. If done in a prayer group, the inquiry is conducted in an informal way, with all free to speak their minds as occasion offers. The leader must only see that the time is not exceeded or the discussion dominated by those inclined to talk more than others. The headings See, Judge, Act, are used to preserve order, but no one who understands them will feel restricted by the pattern they produce. SEE is merely intended to set the scene and to encourage readers to discover the meaning of unusual references and words. It is important to know to whom Our Lord is speaking, whether the lesson taught is intended for one soul or for all Christians, the importance of the occasion, the light thrown on the passage by the other evangelists. Generally, SEE takes one or two minutes at the most. JUDGE introduces the lessons we draw from the passage, and brings Our Lord’s teaching down to the world in which we live. Those familiar with the methods of the saints will recognize in See, Judge, Act a modern variation of Memory, Understanding, Will, one of the best-known forms of prayer in use in the Church. The Gospel Inquiry is neither a quiz nor a Scripture lesson, and it must not be allowed to turn into a lecture or to become the happy hunting ground for academic cranks. Commentaries have their value for some during the time of preparation, but must never take the place of personal thought and prayer. Answers should be simple and straightforward, so that Our Lord’s own words may be clearly heard. Those who have used the method for years have discovered simplicity as the crowning virtue in all inquiries; it is for this reason, no doubt, that quite young children are often able to reach the point of Our Lord’s lesson first. It is not simply a matter of getting right or wrong answers to the questions in this book. Each one is designed to set us thinking and to release the meaning buried in each phrase. Beyond this the questions have no value and should not be taken too seriously. Far better to omit a question than to waste too much time searching for the answer (though one may certainly ask a priest about it afterward). Each question has a purpose and it is designed to lead us to the understanding of a certain point. Sometimes the questions may seem to overlap and to repeat each other; this is not always unintentional, for there is often value in returning to an important point. A word about Act. Normally the Action will be easy to determine; it should, where possible, be concrete, pinning us down to the observance of a particular recommendation of Our Lord’s. Where this is not possible in a prayer group setting—sometimes Our Lord is speaking on intimate subjects which can be decided only by the individual—the inquiry ends with a more general resolution which each may implement as he thinks fit. In this collection of inquiries only general resolutions have been attempted, for it is not possible to enter into the problems and needs of each reader. You must not accept such general resolutions, but instead must try to express in details of behavior the general action printed here. Two points are certain. First, the gospel inquiries are intended for our own sanctification, and our resolutions must concern ourselves. Secondly, no prayer is effective which does not move the will to strive towards good. 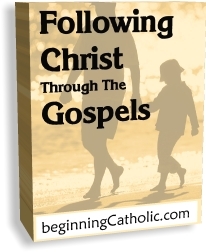 Copyright © 2016 beginningCatholic.com. All rights reserved.